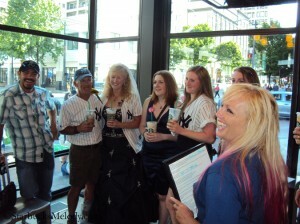 Congratulations to Stacey and Lin, who officially married on Saturday, July 21, 2012, at the Westlake Center Starbucks. The happy couple are from La Grande, Oregon, and both love Starbucks. Hubby Lin Casciato told me that he’d take Stacey to Starbucks “every day” if he could. 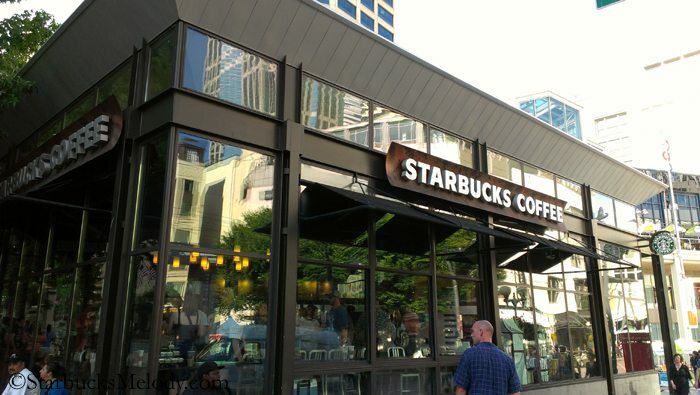 They felt that a Starbucks in Seattle represented to them all that Starbucks was about, and wanted to marry at a flagship store. The wedding was officiated by Bronwen of Seattle-based Shotgun Ceremonies company, in Seattle’s Pioneer Square neighborhood. Stacey and Lin are both huge fans of the New York Yankees so the wedding theme was a blend of Starbucks and the New York Yankees. The couple got married with Starbucks beverages in their hands! Here is the whole wedding party! Everyone looks so happy! It’s been a long while since I’ve featured this store on this blog. My last article about this Starbucks was here, when the store was decorated for last year’s holiday season launch. SuziMcDuff and I worked together in Hawaii! We were the only coffee masters at our store. We really miss having her at our coffee tastings! Hi Shayne! Suzi is awesome! I feel lucky that I got to meet her in person finally! Thanks for dropping by the blog, hope you’ll “like” it and/or subscribe to it. Thanks. Yes she’s a special joy! When I have to re-do her art boards I feel like I am committing a crime Haha. And of course I am subscribed! Mahala! Wow and wow! What a unique place to have a wedding and so great they allowed it to happen. 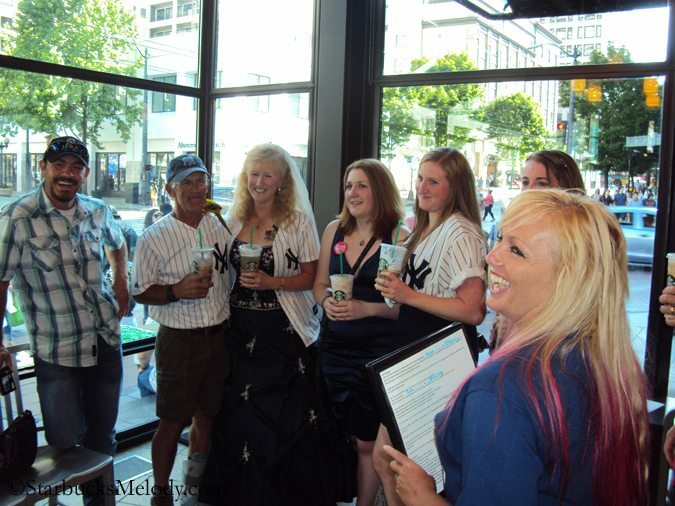 I love Starbucks and I am a Yankees fan…this wedding is right up my alley! Congrats to the new couple. Was such an awesome day! I just love Stacey and Lin to death and sooooo honored to be a part of it!!! An how cool to have it blogged?!!!! A huge shout out to the Westlake Starbucks!! You guys are amazing! Aloha & thanks, Melody! Again, it’s great to have finally met in person! What a neat event this was! Shayne! I miss you too! And Outrigger Reef Sbx! Say “aloha” to the crew for me! @Denise – LOL. I thought the same thing. 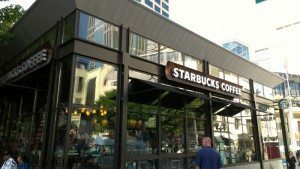 Easier to get married in a Starbucks than Yankee Stadium! @Suzi – See you soon! That was really great! 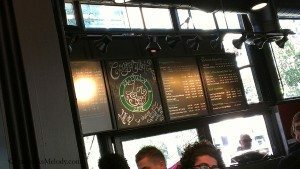 It is nice that Starbucks was able to host an event like this. What a fun wedding!! Shotgun Ceremonies is always available and up for any challenge when it comes to weddings!